Envirosafe Ireland provide the CTS Powder Handling Glovebox which is a safe controlled environment for the weighing and manipulation of high potency drugs with OEL’s of less 1 µg/m³. 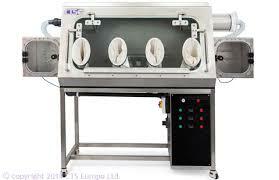 The CTS glove box operates as a single pass through, negative pressure HEPA filltered glove box. Air is passed into the enclosure via a safe change HEPA filter and exits via two more HEPA filters back into the laboratory, or if required, into the laboratory extract system.